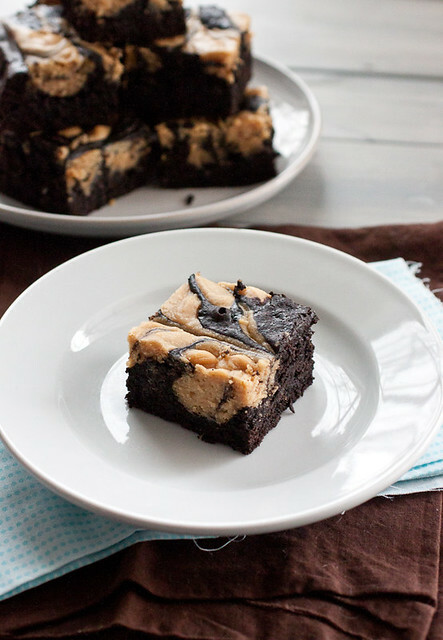 Peanut Butter Cheesecake Swirl Brownies – Peanut butter cheesecake swirled into rich and chewy brownies – perfection for peanut butter lovers in every bite! Happy Valentine’s Day! I’d like to think that as a woman, I’m pretty low-maintenance. This however, is more likely to be adaptive behavior on my part because Kyle is one of the most low-maintenance guys I’ve ever met. As far as one the greatest holidays of the year goes, we roll right through Valentine’s Day without a whole lot of fanfare. Busy restaurants just aren’t our thing and tonight he’ll be cooking dinner for me! I could take or leave a dozen roses. We forget to buy cards and a mutual shrug of “oh well, you know I love you” just works with us. 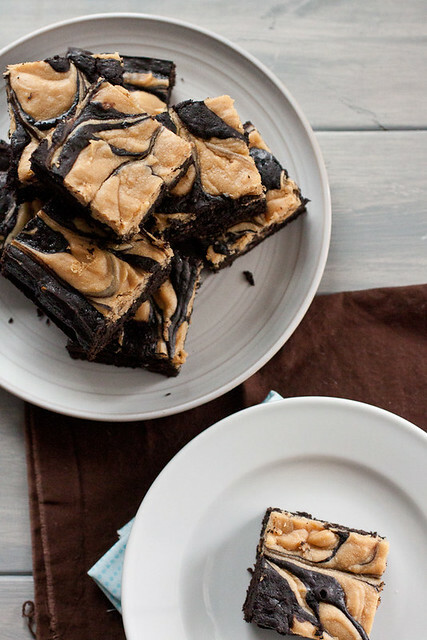 Another thing we definitely agree on are these peanut butter cheesecake swirl brownies. This recipe combines three of our very favorite things into one dessert. So they’re a ton of fun packed into one brownie! The recipe happens in two parts. Two EASY parts – I promise! They start with a quick one-bowl dark chocolate brownie recipe that goes into the baking pan. Then you’ll dollop and swirl a creamy peanut butter cheesecake batter into the brownie batter. The result is pure magic! Especially if you love peanut butter and chocolate together as much as we do! Since I made these peanut butter cheesecake brownies a couple of weeks ago, they won’t be our Valentine’s dessert tonight but I’ve got something else up my sleeve that I’m sure we won’t disagree on! These brownies are super rich. Feel free to cut them into 24 pieces but I don’t think anyone would complain if you cut them smaller. To make the brownies: Preheat the oven to 350° F. Line a 13×9-inch baking pan with foil and spray the foil lightly with baking spray. Melt the butter and chocolate together in a medium saucepan over medium-low heat, stirring constantly until melted. Take the saucepan off the heat and whisk in the cocoa powder, sugar, cream cheese, eggs, and vanilla until well-combined. Add the salt and flour to the saucepan and whisk into the batter until just combined – do not overmix. Pour the brownie batter into the prepared pan and smooth out the top. To make the peanut butter cheesecake swirl layer: Beat the cream cheese, peanut butter, and sugar together at medium-high speed in the bowl of a stand mixer or in a large bowl with a hand mixer until smooth and well-combined, about 2-3 minutes. Beat in the egg and vanilla. Dollop the cheesecake batter two tablespoons at a time over the brownie batter. Swirl the dollops with a knife into the brownie batter. I find it easiest to run the knife through the dollops once across the length of the pan and then once through the dollops across the width of the pan. Bake for 30-35 minutes, until the center of the pan is just set. Transfer the pan to a wire rack and allow the brownies to cool to room temperature. Cover the pan and refrigerate for a couple of hours before lifting the foil out of the pan and cutting the brownies. Brownies will keep in an airtight container at room temperature for 2-3 days. I was working on taxes yesterday when I saw you had posted this recipe. I carefully and immediately packed up my tax stuff and baked these brownies with my daughter – they are delicious! My 5 kids and my sweetie ate half of the pan by bedtime and I assume they will be gone by the time I get home after work tonight. Thanks for the recipe!